Idol worship at the Western Wall? Living in the Old City, I am accustomed to seeing many foreign visitors at the Western Wall. For me, the wall is a minyan factory. It is a place where I can step out of my dorm room and a few minutes later be praying the afternoon service. For others, the wall is so much more. People come from all over the world to have meaningful experiences at Judaism’s “holiest site”. There are some that put little notes in the cracks, and there are those that get their pictures taken with their hands on the wall. I see this every day. The same kinds of tour groups doing the same routine. There are also other practices that take place at the wall. There are people praying 24/7, there are classes, and there are tears. And there is what appears to be idol worship. Please allow me to explain. Just yesterday, I was praying the morning service with a Chassidic minyan. Near the end of the service, a few of us noticed a man that was part of an African tour group on his knees, bowing down to the wall. We looked around uncomfortably, not knowing what to do. I have heard many similar stories, including one of an elderly charedi man trying to help up a visitor that was lying prone on the floor. As he tried to pull up the visitor, the charedi said “not here”. This is a frequent phenomenon that occurs at the Western Wall. It is easy to understand that many visitors are overcome with emotion upon reaching the wall. After all, it is called the Wailing Wall, isn’t it? But when people are on all fours bowing to the wall, something is wrong. I think that is partially our fault as a religion. If you ask someone where the holiest site in Judaism is, they’ll probably respond “the Western Wall”. But that’s not true. The holiest site is the Temple Mount, the place right behind the wall. When I first reached the wall, I’ll be honest – I cried. For twenty minutes straight. I cried because I was so close, yet so far. The Second Temple was destroyed two and a half thousand years ago, and look where we are today. We pray at a plaza by an outer wall of the Temple complex. Today, this wall has become the holiness that many people pray to. Those in Chutz l’Aretz (outside of Israel) pray towards Israel. Those in Israel pray towards Jerusalem. Those in Jerusalem pray towards the Temple Mount, and those at the Kotel should pray towards the Kodesh HaKedoshim. Instead, most pray towards the wall. In many cases, people pray to the wall. This is idol worship. The reason we find ourselves uncomfortable with visitors on all fours bowing down is because Jews do not worship objects. We worship God. If that is so, why do we face the wall when we pray? Should we not pray slanted? There is some irony to reciting “V’anachnu korim” – that other nations bow to nothingness while we bow to God – while bowing to a wall. Apparently Islam has this issue, too. They have taken a more conservative approach and have demolished numerous holy sites. Their logic is that it is better to have nothing than to have idol worship. Don’t get me wrong – in no way could I ever suggest a demolition of our wall. Such an idea would be preposterous. But we need to change the ideology of the wall. The wall is not a place to take selfies. It is a place where, for hundreds of years, Jews have mourned the destruction of the Temple. We concentrate on the wall itself far too often. Let us not forget what is behind that wall (or what isn’t). 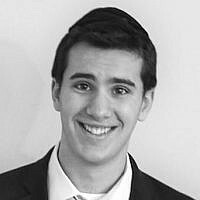 Originally from New Haven, CT Rigel is currently studying in a yeshiva located in Jerusalem. His interests include social issues, urban politics and city planning. Rigel studies Talmud and Chassidut in his free time.